Three of the five highest motorable passes in the world, with a region touching two borders, the second highest saltwater lake in the world, the second coldest inhabited place in the world, three different terrains, three distinct cultures and five mountain ranges. Tripver to Leh. An explorer centrist trip curated for individuals who would like to explore one of the most geographically unique regions in the world. Home to 3 of the 5 worlds highest motor-able passes, high altitude deserts, unexampled mountainous salt water lakes, unique flora & fauna & yes a culture that will leave you mesmerised. The explorer itinerary covers Manali, Rhotang, Keylong, Jispa, Zingzingbar, Barachala, Sarchu, Pang, More Plains, Tangala, Upshi, Karu, Leh Town, Zanskar, Chang La, Dubruk, Tangste, Pangong Tso, Khardung La, Pullu, Nubra Valley, Diskit, Hunder & more. Say goodbye to your city with happiness in your heart, a smile on your face and a kickass bag on your shoulder. Jump into your flight and fasten your seat-belts to restraint your excitement of exploring Heaven on Earth ! 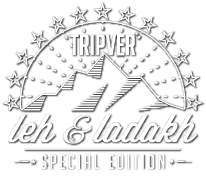 😎 We will have have your room in Tripver Leh Homestay ready perfectly in time for your arrival, once you have settled into your rooms enjoy a hot cup of coffee whilst admiring the mountains and the simplicity of this town. Since Leh is situated at a very high altitude, today you must rest and let your body acclimatize (Mandatory Medical Requirement). As the sun sets you may take a short walk and get a feel of the town followed by a happy social dinner with your travel mates. Crash into your cozy beds by night for an awesome sleep. Today, fresh breeze from the Indus and the chirping of the mountain bird will wash away the fatigue of the long road trip. The Tripver captain will start your day with a breakfast walk down the streets of the old-town dotted with hidden bakeries, after you grab a bite our Local Leh drivers will be waiting to show you around their town. By early evening we would have visited all the highlights of this magical ancient town (Listed Below). In the evening you may hop around town enjoying quaint cafes & old bazaars. We start the day early, and will be driving through the same tracks that formed a part of the Ancient Silk Route. Crossing through the mighty Khardungla Pass (We pause here for quick instagrams & a sip to tea at the army canteen) we reach the Nubra valley. Your homestay will be waiting for your arrival, after a power nap you can head out to the Sand-Dunes for a Bactarian Camel ride, high altitude dune bashing or just relax. Let’s make the day even better with a warm bonfire, a round of happy reminiscent games followed by dinner. Highlights Khardungla Pass (18,379 Feet), Army Canteen, Diskit Monastery, Hunder Dunes, Bonfire Evening, Nubra Homestay, Pullu & more. In the morning your hosts will bid you a fond goodbye as you leave for the airport, nothing will ever be the same anymore after this life changing experience. Miss this trip forever ! Total Nights 5 Nights – however this trip is designed in a way that it starts between 5am & 11am on 19th April and you reach back before office hours on 24th April. So technically you need just 2 days office leave. Unlike others, Tripver™ has its own network of Local Transportation liaisons & propitiatory strict accommodation quality audits to ensure a seamless experience. The above image(s)/creative(s)/iconography & text is owned or licensed by Community Tripver Private Limited. If any of the above said elements/style is reproduced or copied without prior written permission from Community Tripver Private Limited, necessary legal action will be taken. If you wish to use any of the above works for non-commercial purposes you can write to us at a@tripver.com, we may grant permission without any commercial clauses.